Croton | Infonet Biovision Home. Found in Tanzania, Rwanda, Burundi, Uganda, Kenya, Congo (DRC), Malawi, Zambia and Mozambique. 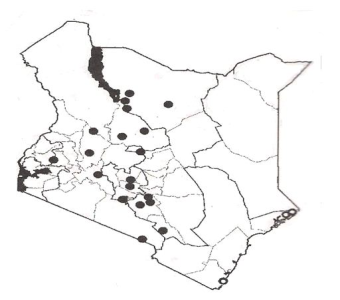 In Kenya it is wide spread, from the south to the western and northern parts of the country. Seed has high oil (30%) and protein content (50%). Oil extract can be a strong purgative. It is not recommended for intercropping due to competition and shade. Cultural beliefs prevent it from being planted close to homes. Found in Ecozones III - V but very common in zone III, 1000 - 2000 m above sea level and is well adapted to variable highland soils. It may be propagated by direct sowing at site (recommended), seedlings (sow seed directly in pots) or wilding. It's fast growing in high potential areas, slow elsewhere; lopping, pollarding and coppicing may be employed. It takes 10 to 25 years to mature. It may occur in mixed farming systems, woodlots, boundaries and, agroforestry systems. Fodder: The seed is incorporated in poultry feeds, as its protein content is high (50%). Fuel: Well-dried nuts are reportedly used in some areas together with charcoal in cooking stoves. The tree is also utilized for firewood. Apiculture: This species produces a dark-ambered honey with strong flavour. Timber: Wood is of medium weight, hard, termite-resistant, strong; it is used for timber and building poles. Medicine: Seed contains up to 32% oils, which have been used favourably as medicine. Bark decoction is used as a remedy for worms and whooping cough. 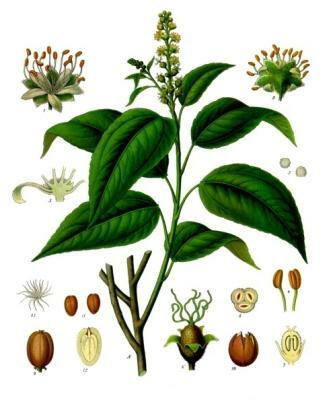 NB: It is said to have almost the same potential as Jatropha curcas in production of fuel. Shade/shelter; It has a flat crown and horizontal layers of branches which make it useful in providing light shade and serving as a windbreak. Soil improver: the leaves have high levels of nitrogen and phosphorus which they can add into the soil when used. Leaves also serve as a source of mulch, eg, in coffee plantations. Ornamental: It has conspicuous flowers which make it suitable as an ornamental. Boundary or barrier or support: The species is not browsed by livestock and therefore a suitable species for live hedge. Croton is susceptible to attacks by Ambrosia beetles in areas of altitude between 1,300 to 2,100 m in Kenya. Other insect pests that may attack it include Scolytidae.